I was looking forward to the release of the iPad for a number of reasons, but mostly because I thought it was going to be very cool. I wasn't disappointed-- it is very cool. I've read a ton of the reviews, both positive and negative, and in general I think both sides make valid points. I'm leaning to the side proclaiming it as a killer device. It's a game changer for sure, but do I want one? Nope. Here's my reasoning. I know this is going to sound a bit absurd, but it's my reality. On background, I need to declare the Internet devices I currently use: I have a desktop Mac Pro with two large LCD monitors, a MacBook Pro with a gorgeous Cinema Display, a Samsung Go (N310) netbook running Ubuntu Netbook Remix, a Barnes and Noble nook eReader, and a 3Gs iPhone. So, the first question I had to ask myself was: Which of these devices does the iPad replace? Where does it fit in the current lineup? For me, quite honestly, it doesn't fit anywhere. It can't replace any of these devices. It sits somewhere between the netbook and the eReader, and has the potential to replace two devices with one. The device in most danger of replacement is the netbook. I use my netbook primarily in meetings, for travel, and while watching television. 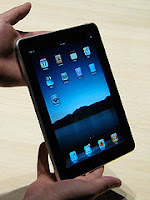 The deal breaker for the iPad here is its proprietary nature-- or quite frankly the apps. One thing I do on my netbook a lot is use Google Wave. I could do this on the iPad, but the thought of having to use Safari instead of Chrome leaves me a bit cold. Which brings me to the nook. I've only had my nook a couple of months but it has become a major part of my life. Let me explain. I spend a ridiculous amount of time online. That time is spent almost entirely reading. I don't consume much in the way of video or other forms of media. My Achilles' heel is asthenopia (eye strain). It's the single thing that keeps me from being able to stay online longer. That said, I love the electrophoretic display, the electronic paper of the nook. It is so eye friendly that it has extended the amount of time I can spend reading by a couple of hours a day. What I find myself doing more and more, is moving articles of interest to the nook for reading later. It has become indispensable. The backlit display of the iPad makes it a show-stopper as an eReader replacement. So the bottom-line for me is I just don't think I need an iPad. I'm setup pretty well as it is, and I don't see it adding that much (if any) advantage over my current netbook. I'm thinking I will wait until my netbook starts to get a little rusty, and hopefully then there will be a killer Android-based or Chrome OS tablet that can fill that niche. I'm not sure everyone is as well equipped as you, but I agree and I'm not sure of the iPad's market. That said (and as I read the book "Blink"), something tells me to pay attention. It's potential failure may very well be the software platform... but I think it's legacy will be its hardware implementation. Everyone will want to take it to the next level. I would see the iPad as a web surfing tablet, not so much a video machine, so I might very well wait for ChromeOS devices to appear. ChromeOS sounds like Google taking a small page out of Apple's book. Apple's got it right that experience matters. What they're missing is that the main value proposition is the network, not the device. Alternatively, maybe Apple is just the first distributor to figure out a revenue model. Charge for the device and let the rest flow in for free. Completely agree with both of you. Google's advantage here is that they are less dependent on selling the device for revenue. Plus, we're going to see many such Chrome devices. Should be some healthy competition. I'd be interested to see how ChromeOS can leverage Google's superior voice recognition technology. Voice search is very impressive, and given the long trail of data google has on its users, it would seem they could easily develop a crackerjack interface for what is essentially a big browser.